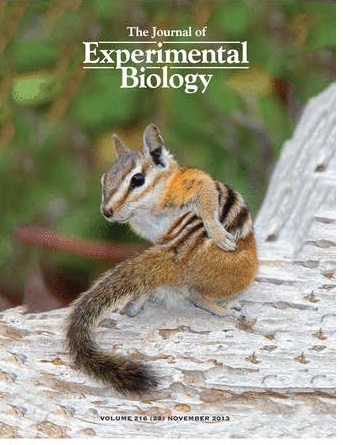 On the cover: Pictured is a least chipmunk, Tamias minimus, a marmotine ground squirrel that is widely distributed across mountainous regions of western North America. Tamias minimus and other semi-fossorial ground squirrels face challenges to respiratory gas transport associated with the chronic hypoxia and hypercapnia of underground burrows and — such challenges are compounded in species that are native to high altitudes. In this issue, Revsbech et al. (pp.4264−4271) report a comparative analysis of hemoglobin structure and function in six species of marmotine ground squirrel that have different altitudinal distributions. Revsbech, I., D. M. Tufts, J. Projecto-Garcia, H. Moriyama, R. E. Weber, J. F. Storz and A. Fago. 2013. Hemoglobin function and allosteric regulation in semi-fossorial rodents (family Sciuridae) with different altitudinal ranges. Journal of Experimental Biology 216, pp. 4264-4271.